The KitchenAid brand of stand mixers, are some of the most capable and reliable machines on the market today. You most likely will have some burning questions, around what the different models are, and how they compare. Given the sheer number and range of them, that’s not surprising! As it happens, you’re in luck…. I have pulled together knowledge and experience of these gleaming icons of the kitchen and put it all in one place. A review to compare some of the best models of KitchenAid mixers right here. I’m going to look at three models from the Professional range as if you’re serious about buying a top class stand mixer, these are the ones to go for. The models we will pull apart are the KitchenAid Professional 5 Plus 5 Quart Stand Mixer, the KitchenAid Professional 6000HD 6 Quart Stand Mixer, and the KitchenAid Pro Line Series 7 Quart Stand Mixer. Why have I chosen those particular models? Read on to find out…. First off, let’s cover why I think the Professional models offer better value than the lower range mixers. As you would expect, the Professional models are more powerful than the Artisan (review here) and Classic (review coming). That means they can handle larger batches of mixtures in one go, whether it’s dough for bread, making batches of cookies or mixing cake mixtures. You will also find them much quieter. Now if you know you’re only going to be using your stand mixer for light duties? You will never be making more than say one or two loaves of bread at the same time? Then possibly the lower range models may be enough? Another important difference is that the KitchenAid Professional models have a lift bowl mechanism. The Classic and Artisan have a tilting head arrangement. Reasons for this are quite simple. The motors in the Professional range are more powerful and on the heavy side. If you tried to build these into a tilting head, it would become too heavy to lift up. Use The Professional KitchenAid Instead Of Your Muscles! Its fixed head results in it being more efficient and stronger. Strong enough to handle the extra power whilst being more stable on your countertop. Of course, it also means that the Professional Stand Mixers themselves are bigger and heavier. In particular, you need to be aware that they are just short of 17 inches high, so if you have low hanging kitchen cupboards they may not fit under them! Lastly, in this quick trip around the differences, you will find the Artisan range comes in many more colors. 24 at the last time of counting, as opposed to between 4 and 10 for some Professional models. At this point let’s take a little departure from our review for some background information. Curious as to the history of the stand mixer? Have a read through this page for more info! And did you know they are still proudly made in America? More interesting info here! And even more here! 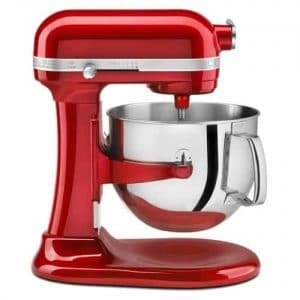 You will find the KitchenAid brand goes all the way back to 1919, and was the name chosen by the inventor of the first stand mixer, for use in the home. Fascinating stuff, but now back to serious business of choosing the right modern day version of KitchenAid stand mixer for you! Even though I’ve narrowed this review down to the higher end ranges, there are still lots of model variants even across these that you could look at. We could be here all day covering those, so I’ve selected 3 of the best! Those with consistently highest reviews on Amazon. This gives you a choice of price and capabilities. Because of that, you can then make the right choice based on your budget and what you plan to be making and baking. Terrific – that means you are finding my stand mixer comparison useful! Time to find out what these KitchenAid Professional HD, Pro Line and Professional Plus Stand Mixers can do for you. Let’s take a look at their features and compare the models to see which one you should go for. And They Do The Grunt Work For You! All have bowl lift mechanisms. Therefore you can lower the bowl to add your ingredients and then raise it by a lever to do the mixing. One benefit this gives you is a larger bowl with a wider mouth, which is really very useful. All the bowls also have a sturdy, comfy handle to hold them by. The downside (compared to the tilt head design) is that you will need to remove the bowl to change beaters, which some might find annoying. A small price to pay I think. The multi-purpose hub attachment on these models has a hinged cover which means it doesn’t get quite so messy over time. A tiny feature (literally!) – but one of those things which makes a huge practical difference over time, and takes away one of the little annoyances in life! This hub allows you to attach many different attachments such as juicers, spiralizers, and grinders to name but a few. And most are a universal fit across all models thankfully! Check the KitchenAid website (www.kitchenaid.com) to make sure before you buy any. There is also an active second-hand market for attachments, so you could save money there! We have a great, and thorough review of KitchenAid Stand Mixer Attachments here. All the models have a 10-speed motor slider control which includes a ‘Slow Start’ feature. Now unless you like getting covered in flour (not since my student days!) this nifty feature is a real plus. No matter what speed you set the slide control to, the beaters will always start slowly, so that it has time to mix in the ingredients before speeding up. Genius! They’re big! As I mentioned before, all these mixers are between 16.5 and 17 inches tall. Not having to tilt the head means that’s as tall as they get unless you add any attachments. So just note, that if you haven’t got enough height between your worktop and cupboards, you may have to find somewhere else to store it. Direct drive steel gears and commercial-style motor protection. This is quite important as steel gears means more durability and less wear. The motor protection will prevent the motor burning out if an obstruction gets in the way of the beaters or attachments. Experience has taught that fingers don’t cause much of an obstruction to these powerful beasts, so keep them out until it’s stopped! All our models have stainless steel bowls, great for chilling mixtures in the refrigerator and cleaning up. They are also dishwasher safe. One tip I’ve picked up is that when new, they sometimes have a protective coating on them and you may need to use vinegar to get this off. Then just wash with soap and water as normal. The bowls also clip firmly into place, so no need to hold on to them anymore when mixing. Customer reviews do say that you may find the procedure of fitting the bowl in place a bit tricky at first. Once you get the hang of it, then it’s as easy as pie! Which of course – your KitchenAid Stand Mixer can help you make! And last, but by no means least is the unique ‘planetary’ mixing action of these KitchenAid mixers and indeed all KitchenAid stand mixers. This causes the beater to spiral within the bowl, for a really efficient and thorough mix. I could watch it for hours I love it so much! Besides the rather obvious difference in bowl sizes and how many cookies you can make in one go, there are a few other things that make up why one model costs more than another. The Pro Line 7 Quart mixer has a flour cup capacity of 16 cups, making a batch of 14 dozen cookies. This stand mixer can really handle large quantities of stiff dough. It will keep going strong, without overheating or slowing down. We’re talking here of kneading enough dough for 3 to 6 loaves at a time! Just make sure you use a slow speed setting (speed setting 2 is recommended). The Professional 6000HD 6 Quart mixer is the mid-range model of our selection and can manage up to 14 flour cups. It can make a batch of 13 dozen cookies without breaking a sweat. Once again this machine will handle prolonged dough kneading without too much trouble. This is at smaller quantities of around 2-4 loaves at a time. Just remember my note about the speed setting above. One unique thing about the bowl supplied with the KitchenAid Professional HD Stand Mixer is that is has a flared tulip shape. Therefore it is even easier to add ingredients whilst its running. Look at the different shape of bowls in the images! As for the Professional 5 Plus 5 Quart KitchenAid Stand Mixer, this is at the lower end of the KitchenAid Professional range and so only manages 9 cups of flour. That’s still plenty for most people. It is capable of producing batches of 9 dozen cookies at a time, so it might be just about right for you. Bread wise, I wouldn’t try and make more than enough dough for around 2 loaves of bread in one go with this one, but it will handle that with power to spare. This is where there is a bit of difference between the two more expensive models and the smaller one. Both the Pro Line 7 and the Professional HD have a DC motor. DC stands for Direct Current. That’s the type of electricity the motor runs on as opposed to AC, or Alternating Current. Don’t worry though, they still plug into the same type of wall socket, all the converting of current happens inside the mixer. So why bother? Well, DC motors are generally more efficient, powerful and quiet which is why most high end and commercial mixers will usually have a DC motor. The Pro Line mixer has a 1.3HP motor. HP stands for horsepower and is used to show how powerful a DC motor is. The 6000HD model has the same basic motor, but it’s restricted to 1.0HP. Now when comparing this to models with an AC motor it gets quite confusing as those motors have their power measured in Watts. Unfortunately comparing the wattage of a DC motor to that of an AC motor does not give you the whole picture. A DC motor can be more powerful even with a lower wattage. If you think of LED bulbs and how a lower wattage one gives off the same amount of light as a higher wattage conventional bulb, it’s the same sort of thing. Yes – I know! I’m sure it’s all done to confuse us too! Note that you will find the wattage of a DC motor powered mixer stamped on the serial number plate. But it’s only really there to follow regulations and is not of any true use. For now, just know the DC motors in the two top models are the reason they can handle large loads very quietly and efficiently! The Professional 5 Plus uses an AC motor rated at 450W. It actually does a really good job, even compared to its big brothers. For an AC motor, it also runs pretty quietly too in comparison to the lower end models. All the stand mixers here come with a nylon-coated flat beater and a nylon coated spiral dough hook. The spiral dough hook is actually a much better attachment than the C hook-shaped ones provided with lesser models and is a real bonus. If you find the dough rides up the spiral dough hook, just stop it and push it back down with a spatula. It’s quite common in mixers, for this to happen so not a problem as such. The KitchenAid mixers also all come with a stainless steel whip attachment. The Pro Line has an 11 wire whip, the other two a 6 wire whip. Of course, the 11 wire whip is far superior, but the 6 wire ones work pretty well. If you do a lot of whisking you might want to invest in the 11 wire whip as an accessory. Only the Pro Line model comes with a pouring shield although you can buy one as an accessory for the Professional 5 Plus. The 6000HD doesn’t have one available for the 6 Quart bowl, but you can buy a smaller 5 Quart bowl that fits the mixer that you can get a pouring shield for. A lot of folks never use them. They either stop the machine to add ingredients, or just turn it down to the lowest speed whilst adding them. No big deal. It’s a personal preference this one. Something else you need to know about the Professional 6000HD Stand Mixer, is that it was a special model created just for one of the big retailers. This means there are very few accessories available for it apart from the ones that come with it, but to be honest, they are all you need anyway! Note – this does not affect the attachments that go in the multi-purpose hub, those are pretty much universal across all the KitchenAid Stand Mixers. They’re all on the heavy side it has to be said. The Pro Line is the heaviest weighing in at a beefy 32lbs. Then comes the Professional 6000HD which measures up at 27lbs. Finally the lightweight of the bunch, the Professional 5 Plus is a mere 25lbs. Now whilst they are heavy, it’s because of their all metal construction and sturdy build. There has to be a trade-off somewhere after all! Worried about being able to move it once it’s in place? Try putting it on a piece of cloth which you can then pull to slide it out. This doesn’t affect the stability but sure makes it easier to move! The benefit of a heavy machine is that it doesn’t walk about when you are intent on getting it to do all the heavy work – lol! Naturally, the mixers all come with a solid warranty. In the case of the Pro Line you get a generous 5 years of worry free use. The others come with a standard 1-year warranty. I’ve checked through lots of customer reviews, for experiences with the after sales service from KitchenAid and it looks really very good overall. Issues seem to get fixed with the least amount of fuss and delay, pointing to a good customer experience. Having heard how great they are, you may well be wondering what these mixers cost so let’s look at that now. All these models are, at the time of writing, available on Amazon with free shipping, that in itself is a huge benefit, and we know Amazon has legendary customer service too! Great news – for the most up to date prices, just hover over the links below, and that will show you Amazons latest, up to the minute prices!!! The most expensive one is, of course, the Pro Line Series 7 Quart Model. Next in line is the Professional 6000HD 6 Quart Stand Mixer. Finally, comes the Professional 5 Plus 5 Quart Stand Mixer. So quite a difference between the models but with all the great information in this article, you now know why. As I mentioned way back up there at the top, which model you go for largely comes down a question of budget and intended use. A perfect example of the quote ‘Know Thyself’ – or at the very least your baking intentions! All these models will serve you well, but if you think you really need the power of the top end machines, then it may be worth going for one of these. Even if it means waiting a while until you can afford it. The KitchenAid 7 Quart Pro Line Stand Mixer is the one to go for if you are expecting to make large batches of bread, cookies etc. The time saved being able to mix larger quantities is a real plus. Even if you don’t plan on making large batches, the extra power will mean you’ve always got plenty in reserve when you need it. This is as near as you can get to a commercial grade mixer without actually buying one! The only downsides are that it’s the more expensive, and that it only comes in 4 colors. The KitchenAid Professional 6000HD – this really hits that sweet spot of the middle ground. Powerful enough to do most of what you can throw at it but at around $200 less than the Pro Line it’s going to be a popular choice. Add in the unique tulip-shaped bowl that makes adding ingredients during mixing far easier it certainly is a good buy. Just beware the fact that you are limited to the accessories that come in the box. If you need to replace one of those, then a call to KitchenAid is required as they don’t show up on their website. Like the Pro Line, this also comes in just 4 colors. Finally, the KitchenAid Professional 5 Plus 5 Quart Stand Mixer and if you’re on a tighter budget, this is probably the model for you. At approximately $300 less than the top model, unless you need to make the larger batches of dough then this will do you just fine. Note that at this price, it’s cheaper than some of the lower end Artisan models, what a bargain! As an added bonus it also comes in 10 different colors. Woohoo! I hope this article has helped you compare KitchenAid Stand Mixers so that you have a good idea of which one you’re going to buy. Now, go get that shiny new mixer by clicking on one of the models above, or below, and get baking! Just – don’t forget to share!!! Thank you for the in-depth information you provided. I do own the Professional 5 Plus. It was a replacement (on warranty) for the Professional HD. I found the HD to be noisier and it had a bit of a squeel to it as well. The Professional 5 Plus is much quieter – similar to my old tilt head model that I gave to my daughter. One tip that I wanted to mention was that I use a cutting mat under my mixer and it is great to pull it out/push it back in as I keep my mixer back in the corner of my counter and I did find it difficult to get in/out. But if she has ‘outgrown her current model – perhaps the ProLine 7 Quart would be a better long term choice for her – it has a great special, but is still more expensive approx $428. It has the 1.3HP motor, and a 7 quart bowl.